the mythical bird standing with wings folded and head held high, staring into the distance with large rounded eyes and clutching a ‘pearl’ in its hooked beak, the top of the head with a hollow rounded crest and the back of the neck with a long stylized plume, its wide trefoil tail curled down behind, the feathers on its chest simply modelled in two tiers above the powerful conjoined legs ending in large talons firmly set on the broad shell of a large tortoise shown crouching on four sturdy legs, its head extended and held up with mouth open, gazing forward in the same direction as the phoenix, its shell incised with a regular pattern of concentric hexagons within a line border around the rippled outer edge, the gray pottery covered with white slip, showing traces of red pigment and with remains of earth from burial. 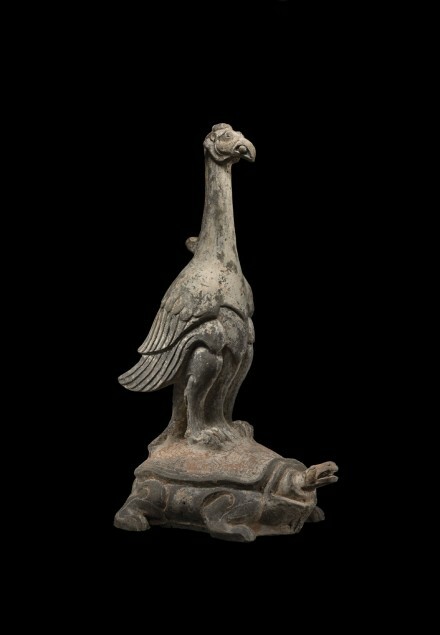 A very similarly modelled gray pottery group of a phoenix standing on a tortoise excavated from an early Western Han tomb discovered at Fannan village in the northern suburbs of Xi’an city in 1992 and now in the collection of the Xi’an Institute of Archaeology and Conservation was exhibited at the Miho Museum, Shigaraki, Japan and illustrated in the catalogue entitled Selected Pottery Treasures from Xi’an, Tokyo, 2004, pp. 10 and 11, no. 1, described on p. 150, where the authors suggest that the sculpture was intended to serve as a guardian figure, warding off evil. Compare also the bronze lamp in the form of a similarly modelled phoenix and tortoise group discovered in a Western Han tomb at Haiqu, in the western suburbs of Rizhao city, Shandong province in 2002, illustrated on the cover of 2002 Zhongguo Zhongyao Kaogu Faxian (Major Archaeological Discoveries in China in 2002), and on p. 80 at the end of a summary excavation report.